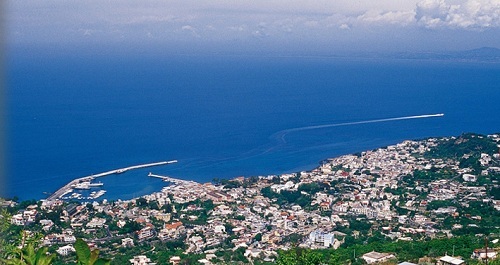 The island lies at the northern end of the Gulf of Naples, about 30 km from the city of Naples. 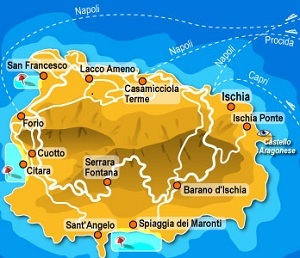 The other comuni of the island are Barano d'Ischia, Casamicciola Terme, Forio, Lacco Ameno and Serrara Fontana. The island has a population of over 60,000 people and the largest of the islands, it was once connected to the mainland. 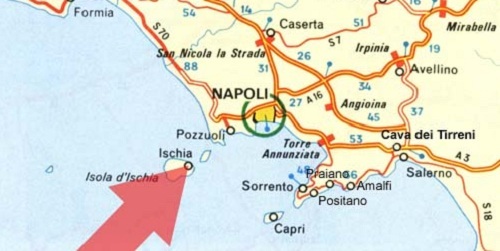 It is easily reached by ferry from Naples, with an approximate travel time of between 40 minutes and one hour. 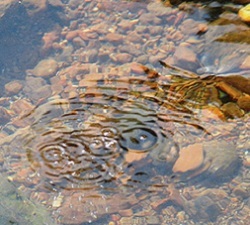 The number of thermal spas on the islands makes it particularly popular with tourists seeking "wellness" holidays. Historically, it was one of the first places in Italy occupied by Greek colonists who remained independent until the eruption of 500 BC, which forced the original settlers to flee becoming a colony of Neaples absorbing the cults, customs and culture. 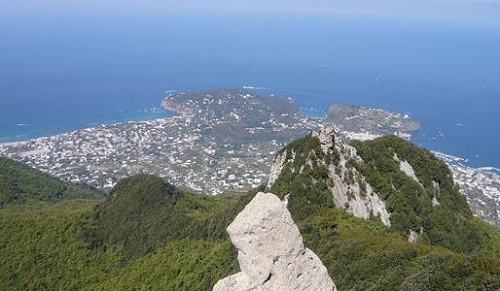 Called "Green Island" for its abundant vegetation, favored by the fertility of the soil and the mild climate, Ischia is dominated by Mount Epomeo, an extinct volcano, and is dotted with numerous small craters, active in prehistoric times. 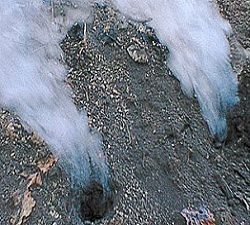 Ancient volcanic traces remain today in the many hot springs and fumaroles are present at the coast and on the seabed. 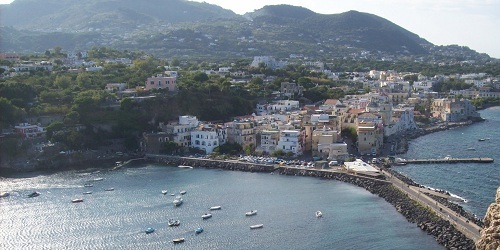 Today, Ischia is a popular tourist destination, welcoming up to 6 million visitors per year, mainly from the Italian mainland as well as Germany (approximately 5,000 Germans are resident on the island), and for the well-to-do Eastern Europeans. ...from here there are several trails leading to the hill of the Sentinella, the location of the astronomical observatory and the peak Epomeo , from which you can admire a magnificent panorama of the Tyrrhenian coast. 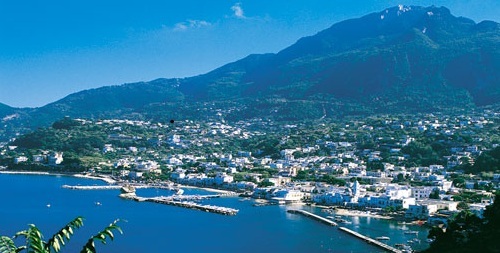 Lacco Ameno is a fashionable seaside resort and spa located at the foot of Mount Epomeo, and is characterized by the so-called "mushroom", a water eroded rocky island. Forio d'Ischia is a characteristic village perched on a promontory on the west coast of the island, the village stands a cylindrical tower, used as a lookout to defend against pirate raids in the Middle Ages. On the tip of the promontory is the Santuario del Soccorso and from here you can enjoy a breathtaking view of the Gulf of Gaeta, beyond Forio, a path leads to the beach of Citara, the Punta Imperatore and the fumaroles in the village of Cuotto. 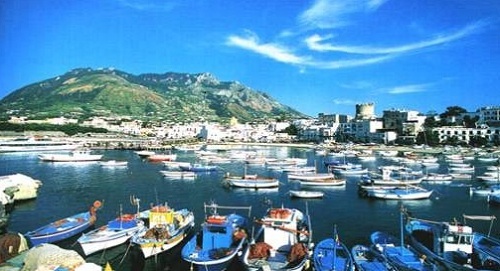 Sant'Angelo d'Ischia is instead a charming hamlet consisting of fishermen's houses set against a hillside, and characterized by an isthmus that leads to a rocky promontory, nearby is the Maronti beach, also present are the fumaroles and thermal waters that spring from the rock. At the southern foot of the Epomeo, located between hills and slopes is the village of Serrara Fontana, surrounded by other villages including Forio d'Ischia, where you can enjoy an excellent view of the Fields Flegrei. 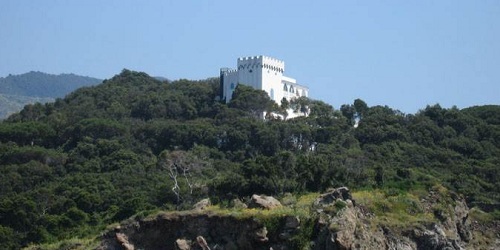 The Aragonese Castle was built on a rock near the island in 474 BC to control enemy fleets' movements. 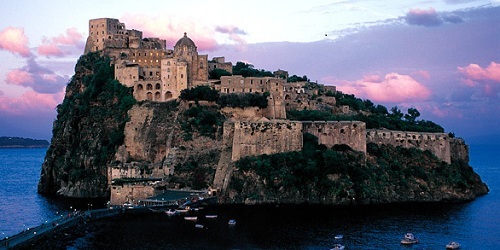 The rock was then occupied by Parthenopeans (the ancient inhabitants of Naples). In 326 BC the fortress was captured by Romans, and then again by the Parthenopeans. In 1441 Alfonso V of Aragon connected the rock to the island with a stone bridge instead of the prior wood bridge, and fortified the walls in order to defend the inhabitants against the raids of pirates. 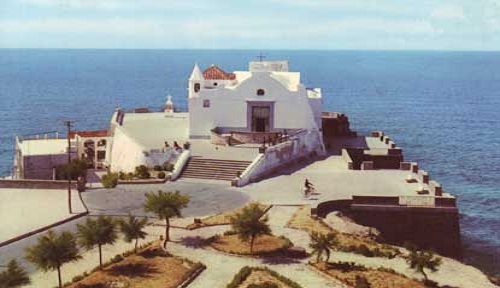 Today the castle is the most visited monument of the island. It is accessed through a tunnel with large openings which let the light enter. Along the tunnel there is a small chapel consecrated to Saint John Joseph of the Cross (San Giovan Giuseppe della Croce), the patron saint of the island. A more comfortable access is also possible with a modern lift. Gardens of La Mortella - The gardens include wonderful views over the city and harbour of Forio. 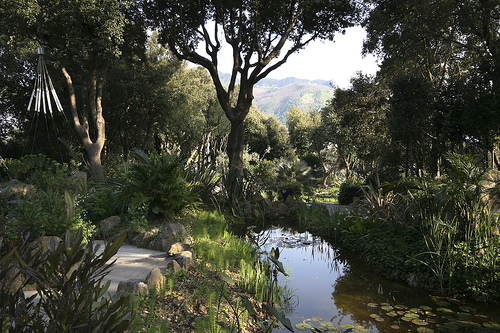 The gardens, located in Forio-San Francesco, were originally the property of English composer William Walton. Walton lived in the villa next to the gardens with his Argentinian wife Susana. When the composer arrived on the island in 1946, he immediately called Russell Page from England to lay out the garden. Wonderful tropical and Mediterranean plants were planted and some have now reached amazing proportions. Gardens of Villa Ravino - A botanical garden, located in Forio-Citara Bay, the result of 50 years of great passion and loving work of Captain Giuseppe D'Ambra, the owner of the Villa. 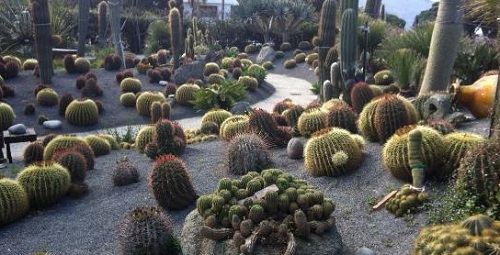 The garden has one of the richest collection of cacti and succulents cultivated outdoors in Europe. Giardini Ravino has been awarded from the OPE (European Parliamentary Observatory) as the most ecofriendly property in South Italy. Giardini Ravino is also the location of Meristema Fair, an exhibition dedicated to both professional and quality amateur gardeners, enriched with seminars and hands on experiences handling and discussing for various reasons about biodiversity in nature. Villa La Colombaia - The villa is located in Lacco Ameno and Forio territories. Surrounded by a park, the villa (called "The Dovecote") was made by Luigi Patalano, a famous local socialist and journalist. It is now the seat of a cultural institution and museum dedicated to movie maker Luchino Visconti.